SEC offers several luxury furniture designer collections and over 500 luxury seats. 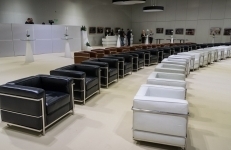 Whether you want to create a club atmosphere in the event hall or present a new product in the lounge area - the beautiful luxury furniture will help emphasize the style of your event. If you would like to create a unique event which consists of separate areas, but you are unsure of how and where to divide the halls - our creative team will create a visual project and help you get a clear idea of the service we offer.